Antique Francis Higgins & Son silverplate footed tea set with teapot (tea pot)) with fruit wood handle and ebony ebonized lid finial, open creamer and open sugar, all with tiny round ball feet. 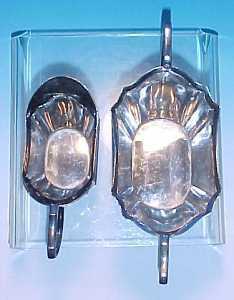 (c. 1868 - early 1900's) This set is in very good overall condition with no significant dents, dings or repairs or silver wear or loss. Never engraved. 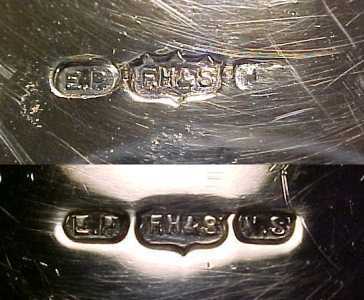 The markings FH & S on silverplate are those of Francis Higgins (and successors). Francis Higgins was second only to Chawner & Co in terms of their importance as producers of hand-made silver flatware in Victorian England. Francis Higgins produced some exquisite patterns and are notable for their designs for small serving items in particular caddy spoons. Francis Higgins II first entered his mark at the London Assay office in 1817 as a plate worker, however the family's involvement in silversmithing can be traced back to 1782 when James Higgins, a spoon polisher, apprenticed his son Francis I as a spoon maker to John Manby. Francis Higgins II remained in business for the next 60 years until he died in 1880 when his son Francis III took over. Francis Higgins and Sons (as the company had been called since 1868) bought Holland, Aldwinckle & Slater (purchasers of Chawner & Co in 1883) in 1922, but by 1940 the company had closed down. 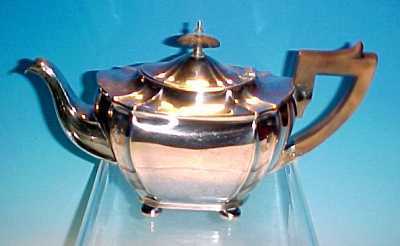 The fruitwood handle on the teapot is loose and the ebony or ebonized final on the lid is very loose. 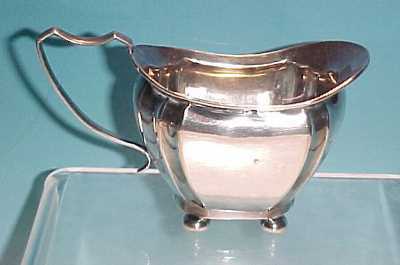 The lid of the silverplate teapot fits tightly, but is loose at the hinge. There are tiny areas of silver wear on the outside, and we found two tiny dings on edges, but they are so small, they're barely noticeable. The inside of the teapot is discolored. 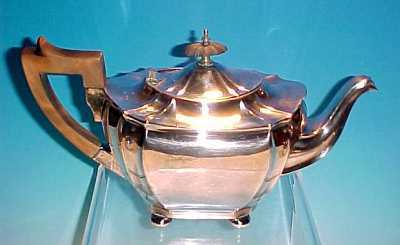 The antique silverplate footed teapot measures 6-1/2" tall to the top of the ebonized finial, the pot itself measures 4-1/4" x 6-1/2" in diameter, 11-1/2" from the outside tip of the fruitwood handle to the outside tip of the teapot spout and weighs 1 pound 6.6 ounces. Four round ball feet. The matching footed open sugar bowl has no dings or dents, and we found only one tiny spot of oxidation on the inside of the bowl. 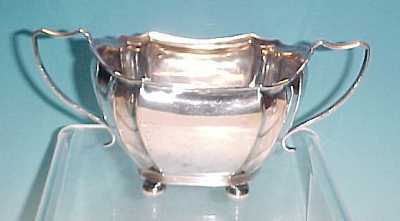 The silverplate is still very thickly applied and in extremely good condition. 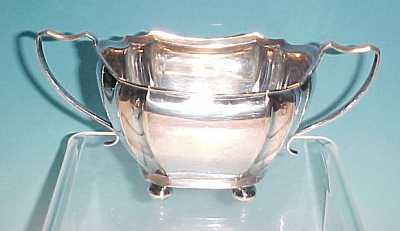 This antique silverplate footed open sugar bowl has two handles and measures 8-1/2" handle to handle, 3-1/2" wide, 4" tall to the top of the handles, 3-1/2" tall to the lip of the sugar bowl, and weighs 9.5 ounces and has four ball feet. The matching footed creamer has no dings or dents, though we found one spot of discoloration on the outside (see photo) and there is a thin line of discoloration in the bottom of the creamer along the edge. 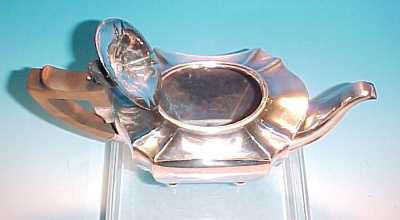 The silverplate is still very thickly applied and in extremely good condition. 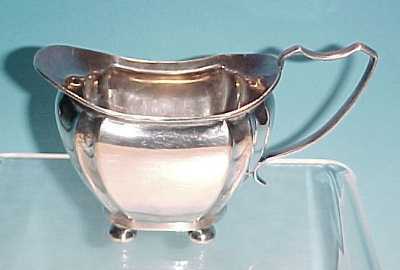 This antique silverplate open footed creamer measures 3-7/8" tall to the top of the handle, the body is 4-1/4" x 2-3/8" in diameter, weighs 5.5 ounces and has four tiny round ball feet. 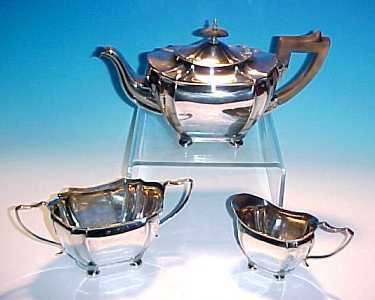 All three antique English silverplate tea set items are marked on the bottoms with the F H & S hallmark within a shield, and EPNS.